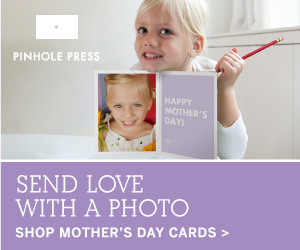 Today’s DIY comes to you from a new contributor! 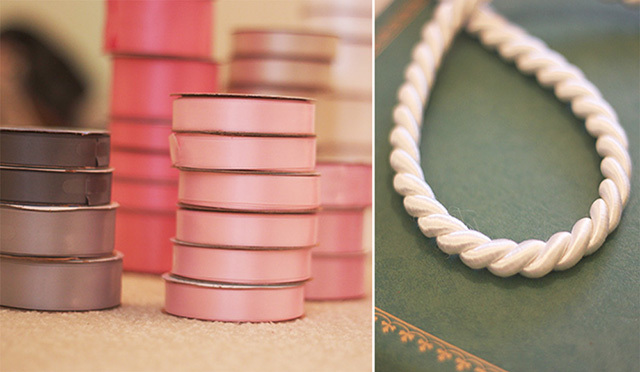 I’m hoping to share many more fab DIYs thanks to my lovely contributors. 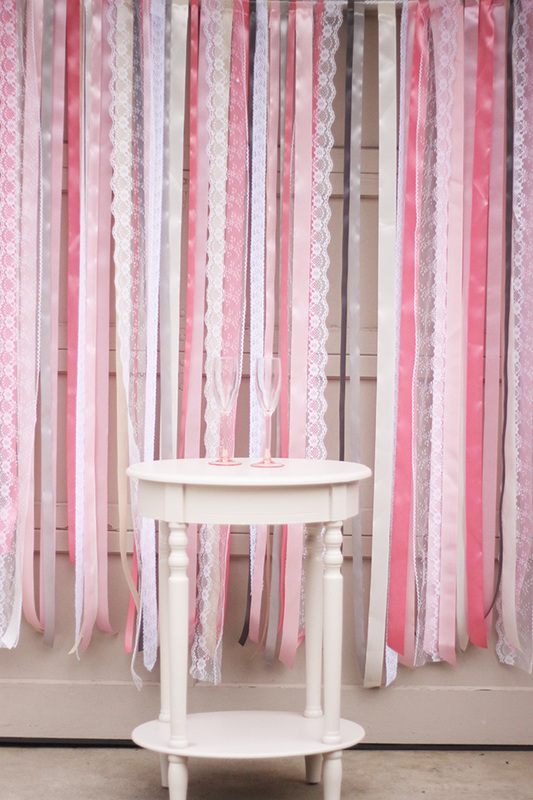 Step 1: With your tape measure, measure how wide you want your ribbon backdrop to span. We made ours 6ft wide by 5ft long, because we figured that was large enough for a few people to fit into one photo frame. 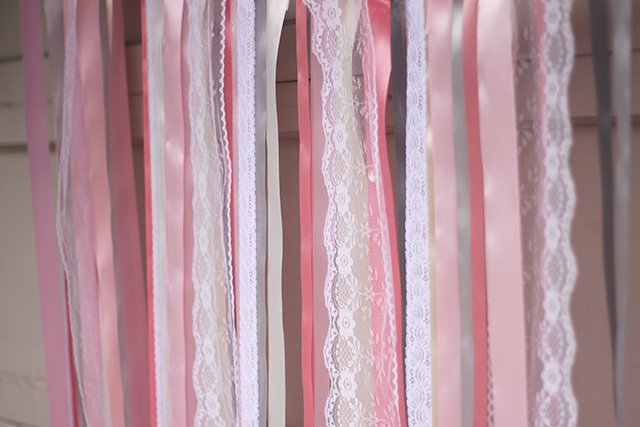 Step 2: Cut your strips of ribbon and lace and lay them out in the pattern you want to glue them in. 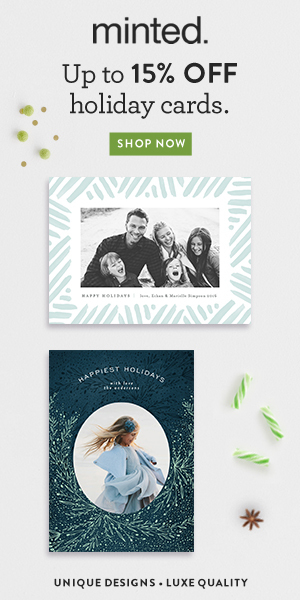 I suggest this, because we realized we bought about 10 rolls of ribbon we weren’t going to need– back to the store they went! 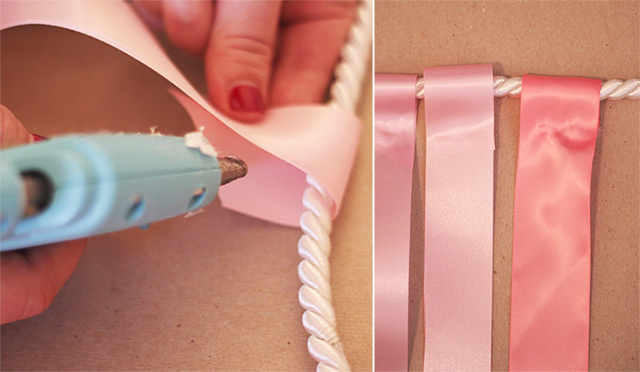 Step 3: Wrap the top of the ribbon around the cord. We chose a sturdy white cord typically used for trim. 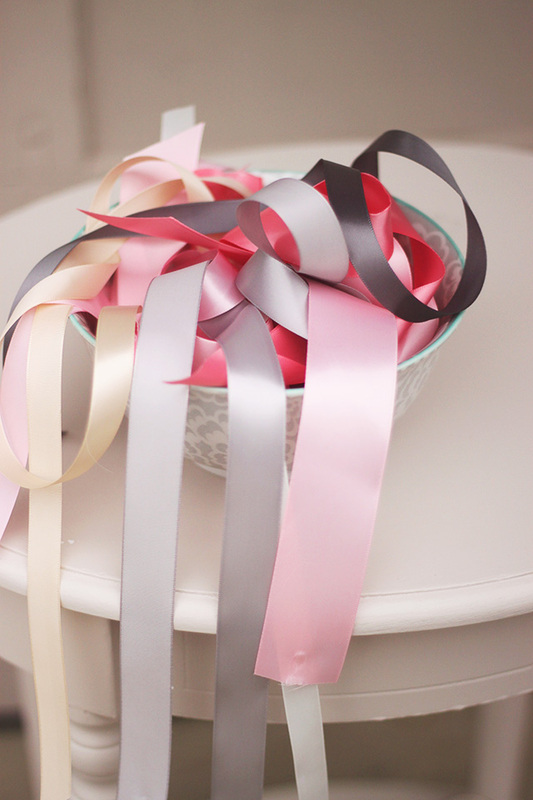 It’s the perfect weight to hold all this ribbon. We wanted to be able to adjust the positioning of the ribbon on the day of (in case anything needed to be fixed due to travel), so we made the ribbon wrap around the cord which enables it to be slid right or left, similar to a curtain panel on a rod. 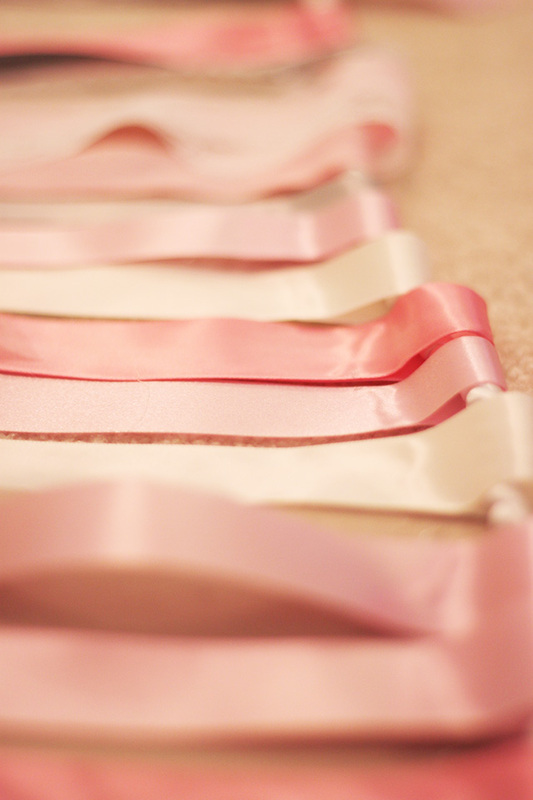 Step 4: Continue gluing ribbon until you reach the end of the cord. 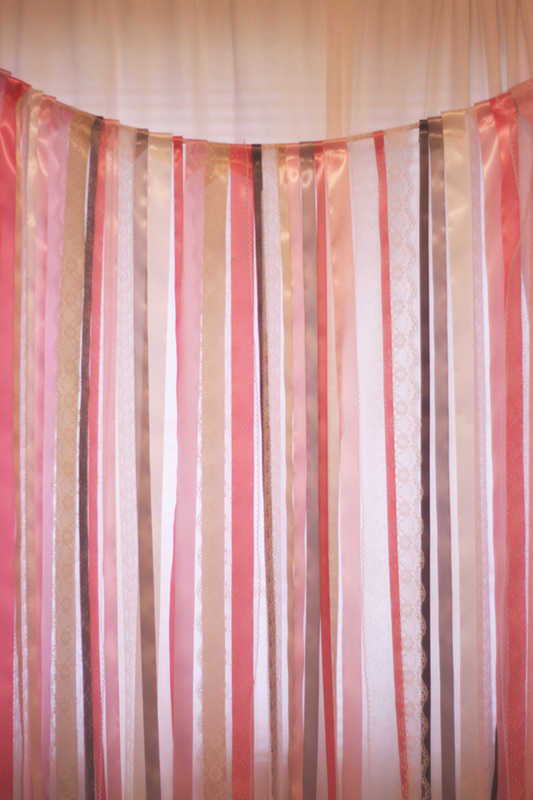 Leave about 8 inches on either end so you can easily tie the ribbon backdrop wherever you need to attach it. so pretty! thanks for sharing this! Perfect and something even I could manage! I am wondering just how much ribbon this took? Did you mean 20 yards or 20 bolts of ribbon? Or 20 yards of each color? It’s very pretty. Thanks. would love to know how much ribbon was used for these measurements? Love it! How many rolls of ribbon did you use? Yes, same question- how many rolls of various ribbons were used for the 6×5’?